Debra Gangelhoff has been working in fiber arts for over 30 years. She enjoys everything from quilting to rug hooking with a special emphasis on embroidery. 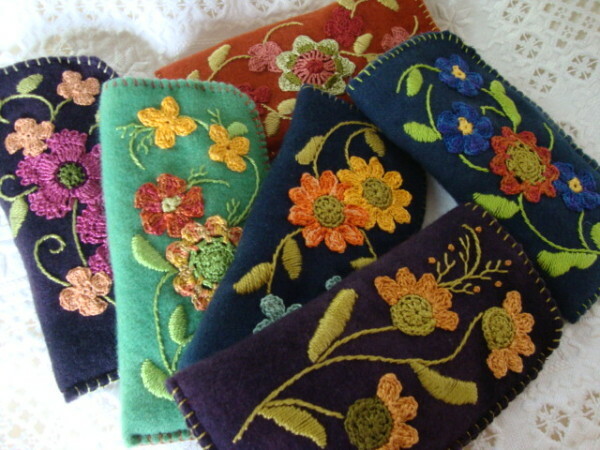 Recently she has devoted much of her time to making functional items such as pincushions and eyeglass cases. She uses hand dyed wool and crocheted floral patterns of her own design to create unique products that are both useful and decorative. She is self- taught and enjoys paging through needlework books on embroidery from the past and loves to incorporate color into her creations, often looking to nature for inspiration. What she enjoys about working in fiber arts is the variety of projects she can create as well as the colors and textures she can use.